At the beginning of December the Syrian Arab Army (SAA) and their allies complete their liberation of East Aleppo from the terrorists who have occupied it for almost four years. The majority of the media in the US and UK continue to portray Assad as the bloody handed ‘Butcher of Damascus’ indiscriminately slaughtering civilians in his war against the heroic anti-Assad ‘rebels’. 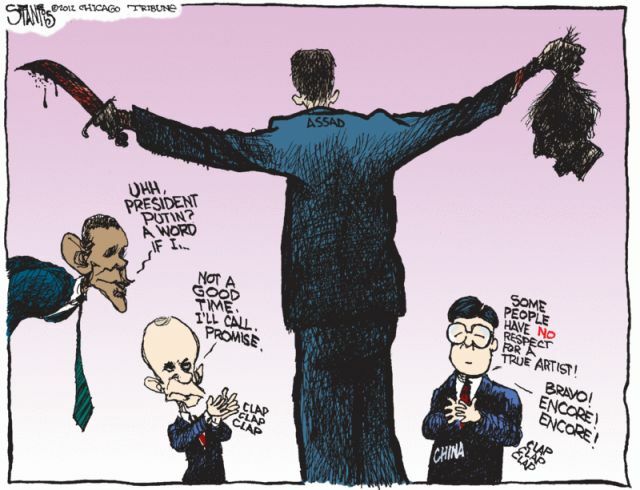 This cartoon, showing a concerned US trying to reason with China and Russia who are seen as enabling Assad, is particularly ironic as it is the groups Assad is fighting that actually do behead people. News out of Syria uses pictures and interviews with children in ‘rebel’ held sections of Aleppo to justify claims that the Syrian government and the Russians are committing war crimes in their bid to oust ‘moderate rebels’. These reports are biased and designed to garner support for US attacks against Syrian and Russian forces or at least to get the Russians to back down in the face of direct confrontation with US and allied forces. There is very little evidence that there are any ‘moderate rebels’ in the disputed East Aleppo, rather they are ‘takfiri’ extremists of the worst kind. These extremists are supported by the US and UK governments and by our political and media establishments. In the following video posted by ‘Syrian Girl’ (Maram Susli) these monsters show their true colours as they prepare to behead a 12 year old boy. That the war caused devastation in Aleppo is obvious but the videos of people leaving the areas of Aleppo that the SAA has retaken show people who seem happy with what has happened. 4. General Michael Flynn a former US Defense Intelligence Agency (DIA) chief admits that his agency in 2012 concluded that the Salafists, the Muslim Brotherhood and Al Qaeda in Iraq were the major forces driving the insurgency in Syria and that in 2012 the US was helping coordinate arms transfers to those same groups. Flynn believes that the US should have supported the Free Syrian Army (FSA) more strongly at the beginning of the insurgency and that it was the failure to do so that led to the insurgency becoming dominated by these ‘more extreme’ elements. Flynn admits the US intention to bring down the Syrian state and implies that he shared this intention but he is critical of the Obama administration for failing to take more robust action earlier and for then supporting the extremists. Eventually the joy of Syrians at the liberation is undeniable. We see Syrian Christians celebrating Christmas together with Syrian Muslims. Should We Kill All Alawites?